“Mmm, give me a second… I’ll try to find the best ones”. I watch him, bemused; a pensive gentle giant as he slowly walks up and down his shop scrupulously eyeing up each painting – passing one after another, each intricately detailed and bursting with vibrant colours of sunsets, rainforests, African plains. A true artist, he can’t help but strive for perfection in his work. He pauses in front of a large painting of a traditional Kenyan landscape – red rich earth with patches of yellowing grass and acacia trees, scattered before the impressively omnipresent Mount Kenya in the background. He gently wipes his hand across the surface for dust, and steps back to look at it for a few seconds. He thinks. “I don’t know whether – “, he turns back to me and breaks off with a sheepish smile. “Oh! You’re filming, sorry! I would have gotten out the way if I’d known”. Benson Gitari is a born and bred Kenyan artist, from the Mount Kenya region, now residing in Diani Beach, South Coast, Kenya. His shop sits at the bustling roadside, nestled cosily between other shops selling patterned kikoys, woven bags and wooden touristic memorabilia. When I arrive, his team are deeply focused within their respective creative zones. Eric Gitari, Benson's son, paints a huge life-like lion – abstract with kaleidoscopic colours. David Mwangi sits beside him working on the beginnings of a coy-looking zebra. The dozens of paintings set up outside seem brighter under the baking sun and baby blue sky, a contrasting array of warm and cool shades. Inside, Benson’s wife Margaret sits at a table, surrounded by a rainbow sea of multi-coloured toy boats made of cut up flip flops. The walls are covered with art, with a few eerily realistic portraits made for clients, copied from photographs. The multitude of chromatic paintings of wildlife and landscape speaks volumes about his affection for it. “Ah, those ones”, he says with a (I soon discover) characteristically wide grin, “I create myself, in my own head, because I’m inspired by nature”. His love of art went back from as far as he could remember, finding a natural talent in it even in primary school. His teachers encouraged him to the point where they would ask him to draw example diagrams for the other students on the board. “I was short, I was little then” he laughs. “I’d be given a chair so I could climb up just to reach the height of the wall”. He continued doing it for fun, consistently being top in art class all through high school, and began to realise that this could become more than just a hobby. “People would start asking me to ‘do this’, or ‘do that for my house’, and I thought ‘I could utilise my passion as a career’”. He moved to Diani aged 28 and set up shop, continuing to work on his craft and finding his style. 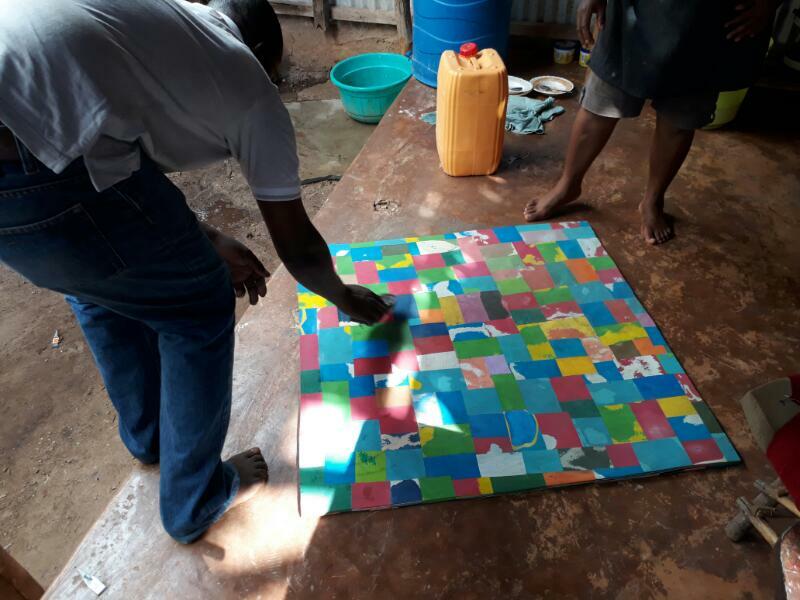 He began incorporating his love of art and the environment by working alongside organisations, running workshops that focused on making crafts out of reusable items, namely flip flops. It was exciting to him, because “it involved lots of different nationalities”, locals and tourists alike – bringing a sense of community through the interest in conservation. As advocates for environmentalism, Benson and his team are an integral part of the FlipFlopi Expedition, tasked with creating ‘plates’ (strong moulded slabs made entirely from discarded flip flops) that will make up the project’s 60ft dhow. Approximately 200,000 flipflops will be collected just from Kenya’s coasts to be cleaned, cut, moulded and glued together for the boat, which will then set sail from Kenya to South Africa in 2018. With the dhow made entirely from waste plastics, the task seems enormous, but Benson and his team aren’t swayed by the challenge. They’ve already constructed two large sculptures in the past, using flipflops to exemplify just how many find their way onto Kenya’s beaches: a large whale, and a large turtle, the latter of which is by Diani’s Nakumatt supermarket. Benson smiles: “The funny thing is some people didn’t think we made it. They thought it was imported”. They’re water resistant, he explains – durable even. And absolutely not in short supply on the Kenyan coasts. With so many flipflops scattered on the beach, abandoned after breaking apart or being washed ashore, Benson and the FlipFlopi Expedition wanted to present a clear message about the wasteful attitude we as a society have on our environment, whilst turning this negative impact into a positive in a visual and creative way. 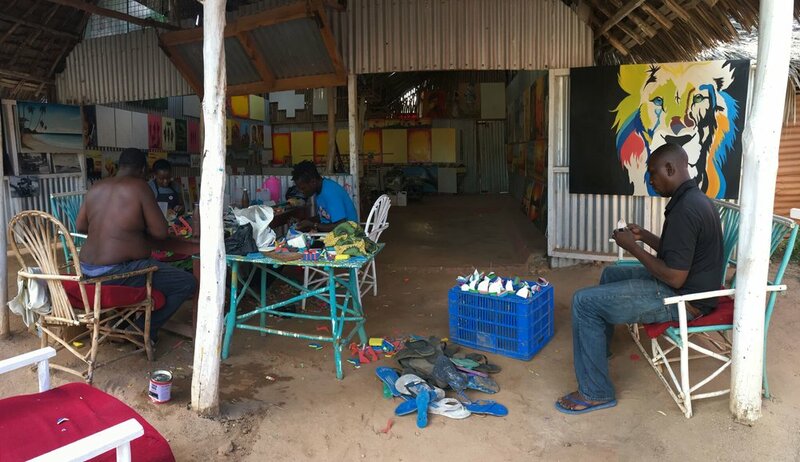 Benson leans back in his chair, his eyes light up: “The beauty of those colours, of the flipflops, relate to what I do - with art, working with colours. So I would manipulate the same colours that are in the flip flops to make beautiful sculptures, beautiful crafts out of flipflops”. But whilst there is an increasingly positive attitude towards becoming more ecologically friendly in Kenya, the problem isn’t solved by merely picking up the waste left on the beach. The ongoing issues continue submerged deep in our oceans; out of sight, out of mind. Benson muses. “When I was collecting these flipflops, I learned something interesting – that bits of them were eaten, by the sea life. Since the flip flops have really flashy colours, they attract the animals, and they don’t get digested in their stomachs. They’re just piling up in their bodies and eventually killing them.” He waves in the direction of the miniature green and blue keychains to the side of us – “Like the turtles”. 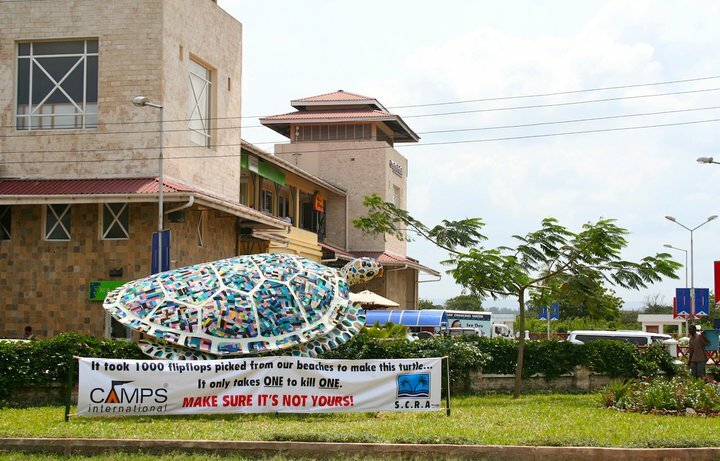 I think of the Nakumatt turtle, with over 1,000 flip flops decorating its shell. “It’s a menace,” he says firmly. “It’s gotten out of hand”. But as easily as he is able to emphasise the severity of what is happening, he reverts back to his positive outlook on the possibility of change, confident that – “If we start to become responsible… on how we use our flip flops when they’re broken, how we can give back to the community, or how we can give back to the people…it can become a cycle. People are starting to embrace the idea”. He goes on to talk about how some people would look at an abandoned flip flop left somewhere on the beach and say – “‘it’s dirty, it’s been on people’s feet’. That’s all they think. But inside, when you cut it open – it’s so beautiful, like the way it looks”. I ask him what he hopes to see from this project. He thinks for a moment. For more information on the FlipFlopi Expedition, go to their website, or find them on Facebook, Instagram and Twitter. Naomi Phillips-Howard studies Film at the University of Amsterdam, with a bachelor’s in Script-writing at Bournemouth University.